Over the last year, my photography has taken me into the world of the performing arts and, in particular, dance. It has been an enjoyable and insightful experience that has given me the chance to meet many talented people and take on new challenges during promotional shoots, show rehearsals, and individual portrait sessions. When I look at my dance images, I can often see the influence of portrait photography coming through as I try to capture the expression, emotion, and movement of an individual dancer or the interaction of a small group. It is difficult to shake off this instinct, and I am not even sure that I want to. Recently, however, I had the chance to turn the tables by bringing the influences of dance into the photography studio. I wanted to see how my experiences with dance photography could inspire my portraiture. 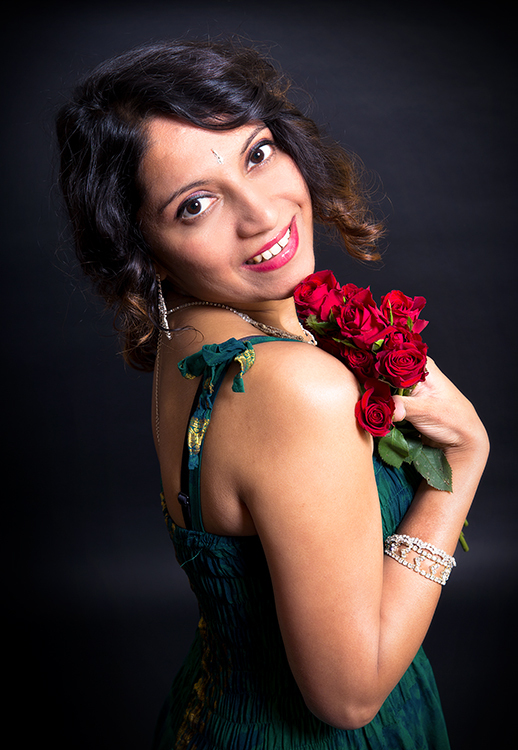 Vidya came to the studio a few weeks after I had seen her perform in a spectacular Cambridge University Dance Society show, where I had been one of the photographers. 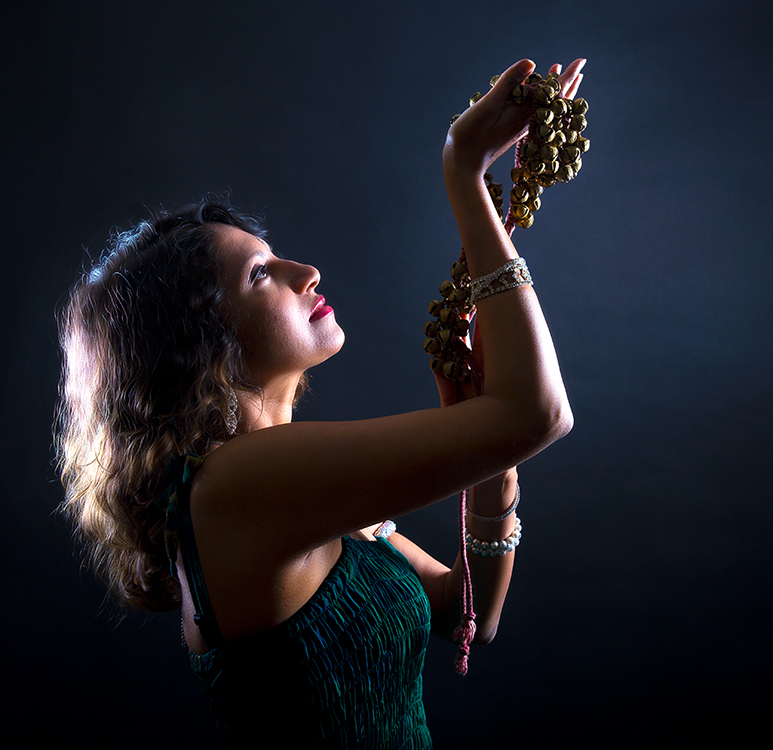 She dances contemporary Kathak, a style originating from India, and had enchanted the audience with a solo routine in which she gathered roses from the stage. In the studio shoot, working alongside photographer Tom Attridge, I was keen to capture some of the spirit of the performance we had seen at the show. Using a black background and carefully-directed lighting, we were able to recreate some of the dramatic effects of stage lighting. Vidya brought with her some beautiful dresses as well as ankle bells (“ghungroo”), which served well as props. 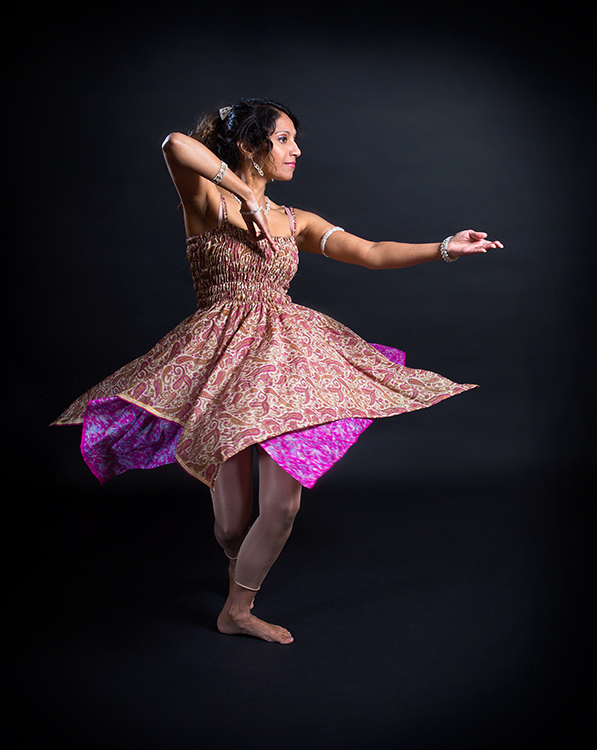 She made the move from stage to photography studio with ease and, with her dance-inspired poses and colourful outfits, I think we were able to capture a taste of Kathak! If you like this article or have any comments, please leave a note for me using the form near the bottom of this page. Thank you, Pat. The upgraded lighting I am using this year gives more flexibility for creative ideas. It worked well for the stage style lighting we were looking to mimic. It’s obviously a real challenge to try and capture the dynamic nature of dance on a static image, but with the creative lighting I think you managed that, and the penultimate photo has great movement and energy. I also liked the pose for the second photo and the lighting on Vidya’s hair. It was good to capture some of the movement and energy of the dance, I agree. 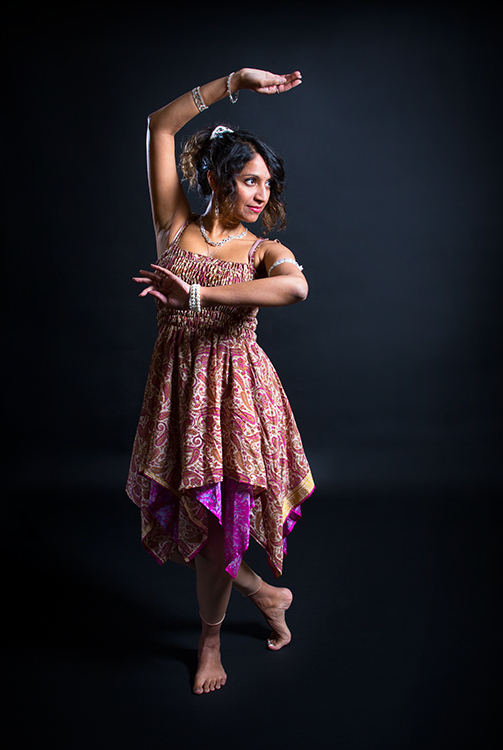 However, I also enjoyed working with some static poses that were inspired by the Kathak style. 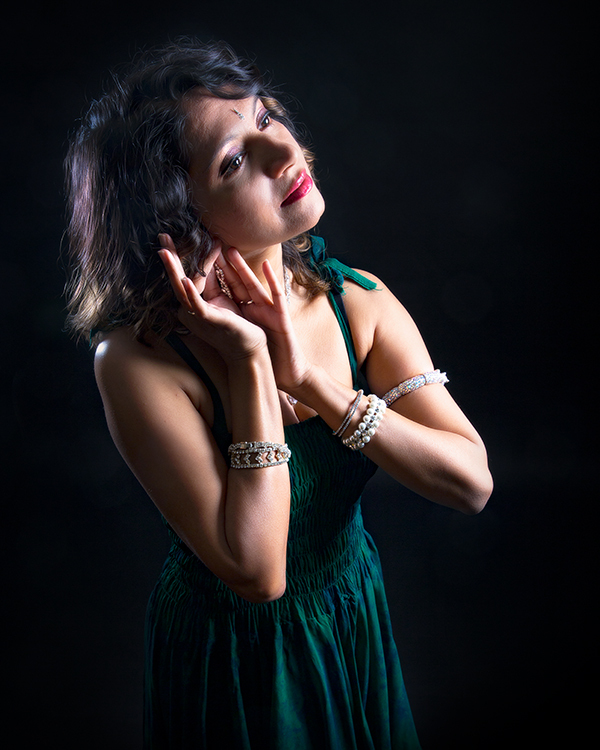 The first image actually represents putting on earrings (a pose that Vidya suggested herself). I think it makes for an interesting and different collection of themed photos. Thank you for your encouraging and thoughtful comments.